I haven’t made cookies in the [amazon_link id=”B001P2FUZC” target=”_blank” container=”” container_class=”” ]dehydrator[/amazon_link] or crackers in a while and thought it was high time to do it again. I wanted something somewhat sweet, but also coconutty. I mixed and threw in a little of this and a little of that and they were super fantastic! The kids love them and we will definitely be doing these again! I’ve mostly labeled them cookies and the kids seem happy with that… although I would eat them as a snack as well. Since there isn’t any sweetener besides the dried fruit I’m not as likely to only let them have them sparingly! 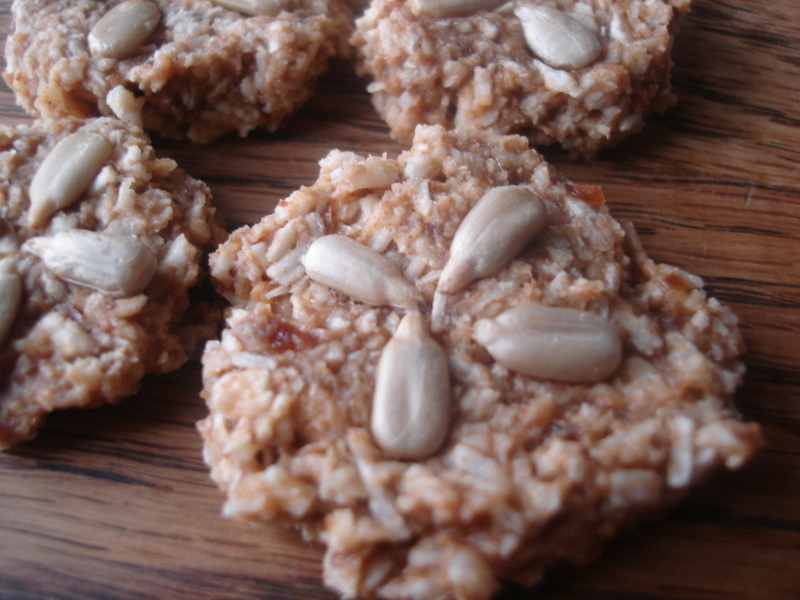 These have been perfect for my afternoon sweet craving and have the added bonus of coconut! I’m hoping to do some different combos in the near future as crackers. I was thinking along the lines of seaweed, sesame seeds, bananas, sunflower seeds… nuts? not sure what else. But once I get a perfected product I’ll be sure to share! 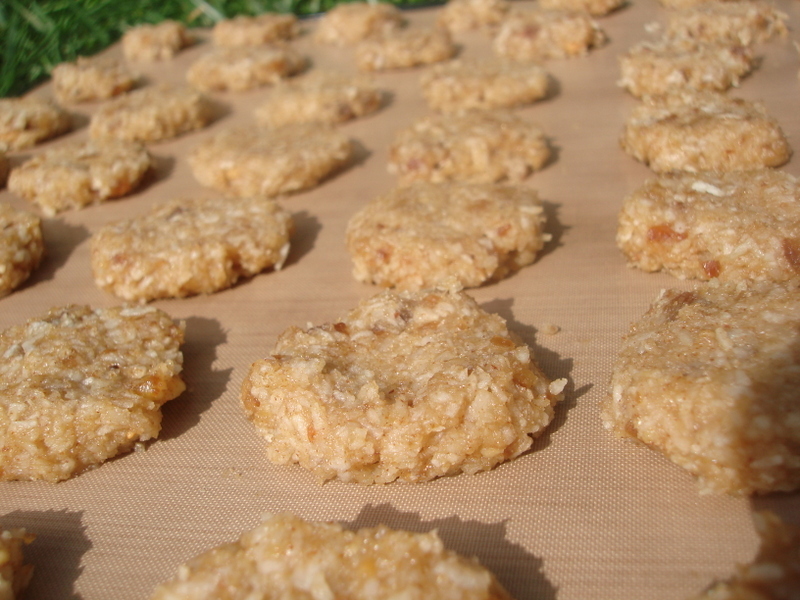 So here is the handy dandy recipe for healthy almond coconut cookies! Mix bananas, dried dates and[amazon_link id=”B000WW2M8Y” target=”_blank” container=”” container_class=”” ] almond butter[/amazon_link] up in [amazon_link id=”B00004S9EM” target=”_blank” container=”” container_class=”” ]food processor[/amazon_link] until smooth or well chopped. Can chop to whatever your desired consistency is. If you like to taste chunks of dried dates in your cookies then don’t blend it as much. Once you’ve processed to your hearts content, pulse just enough to incorporate coconut. Then drop or shape them into small cookies and put on [amazon_link id=”B001PL6MPU” target=”_blank” container=”” container_class=”” ]dehydrator mats[/amazon_link]. [amazon_link id=”B001P2FUZC” target=”_blank” container=”” container_class=”” ]Dehydrate[/amazon_link] on 145 for about 12 – 18 hours. Can dry to desired crispiness! Let me know what you think! I think chocolate and coconut might be one of my next experiments!! !